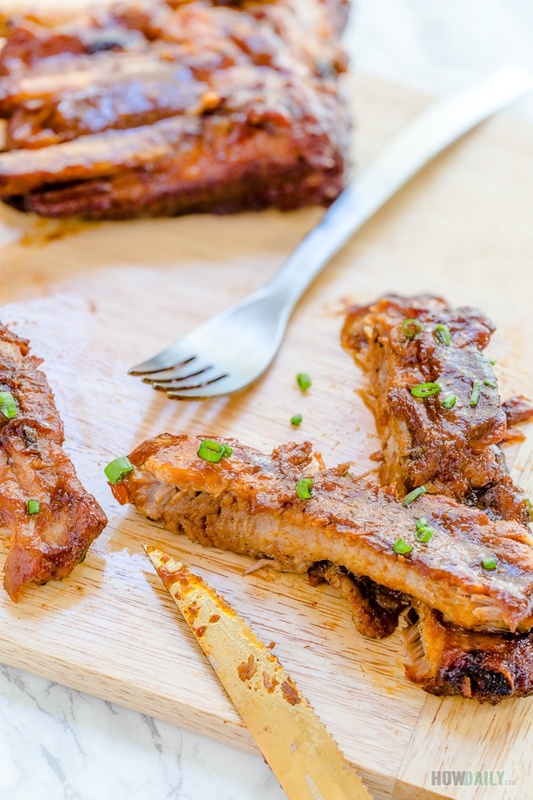 Do you crave for fall off the bone ribs? 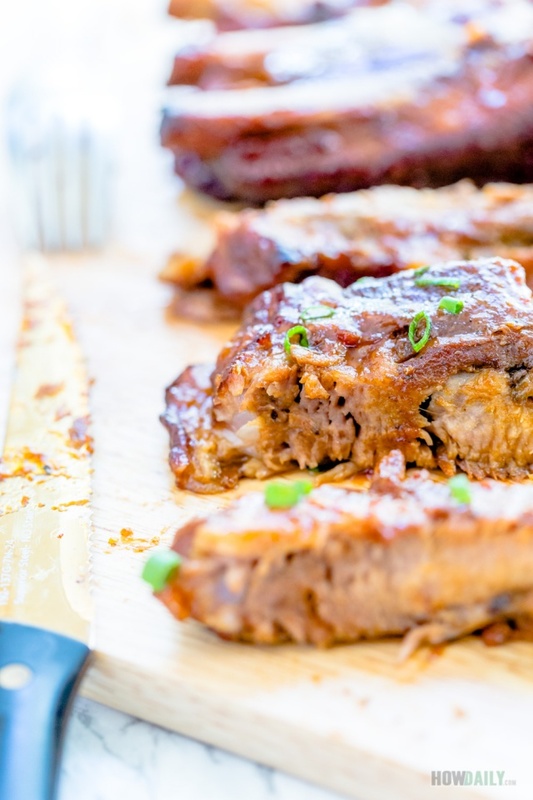 Look no more, this recipe is designate specifically for making baby back rib right from you slow cooker. Anyone would love that fall of the bone ribs at a local restaurant. We can marinade and grill them too. But on those days where grilling is not attainable or simply put, you just want some slab, then grab your slow cooker to “grill” some. 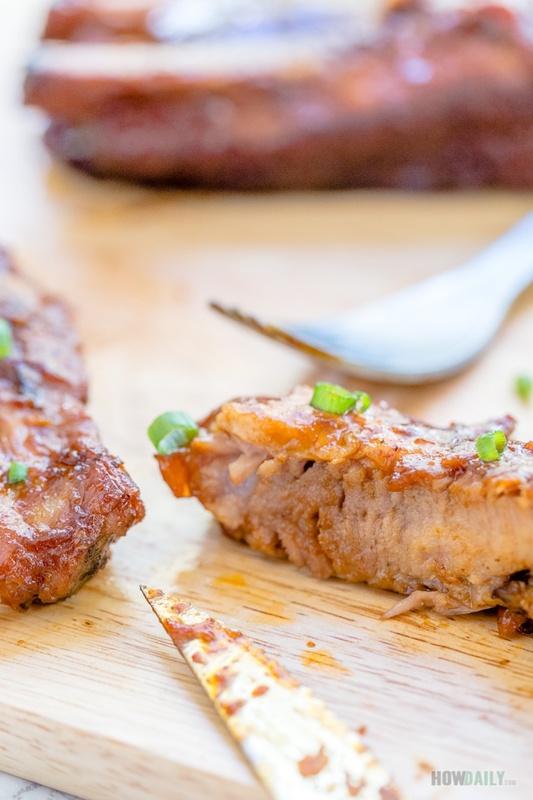 You’ll achieve that BBQ sweet and tangy, savory flavor, juicy meat while being tender. Slow cooker involves cooking at low heat over long duration which is what make the meat tender. Most recipe on ribs would also call for the membrane to be removed, personally I love that chewy texture after it soften a bit. So yes, your choice, just slip your finger through and pull it out. Or like me, pierce with a fork to reserve the texture a bit. Since after such long cooking time, everything is tender enough already. Not to mention the extra acidity from fruit that we’re adding. I learn that trick from most Korean BBQ sauce recipe, they always contain some sort of fruit, notably pear, apple or pineapple… which give the extra sweetness and make the meat much more tender than it should be. For this recipe, you could use any BBQ sauce of your preference, however, I just like to make my own and save it in the fridge. This way, I can control precisely in term of flavor, color appearance and aroma. Not to mention that home made BBQ sauce always feels, well, just right and not as overpower or strong odor like some brands do. Now most people would love the store bought with liquid smoke scent, but you could always add a teaspoon to your home made one and they taste and feel just like on the grill itself. Another note is on the dry rubbing ingredients. These can be as listed, or you can shorten them down to just salt, sugar and ground pepper if you follow the home made BBQ sauce. I don’t add much sugar to the recipe since fruit, ketchup, vinegar… all of those have some sort of sugary in them. Instead I used a vegan mushroom seasoning powder to manipulate the taste a bit, but you can skip as well. Last but not least, try to sear your ribs before slow cooking as well as post-baking to caramelize all sauce to the meat. These steps would enhance the flavor much more to match that of a direct grilling than just being in the slow cooker. Wash the rib and cut ribs to desired size. Use your pinky to slip through and pull out membrane if needed, otherwise, just pierce with a fork if you want more crunch, tendon-like texture. In a clean and dry container, combine all the dry rubbing ingredients. Rub them good onto each side of each slab, crevice and all. Save the extra dry rub to mix with your sauce if desired. Arrange rubbed ribs onto baking sheet and bake for 20 minutes with turning in between to sear all the meat and seal in flavor. This should remove some extra fat as well. Once your ribs are all seared, remove from oven, and arrange into your slow cooker. 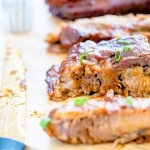 Arrange each rubbed and seasoned slab into your slow cooker. Pour 2 cups of sauce (store bought or make per instruction below) all over the ribs. Crush garlic and chop onion. Peel, core and blend or puree your fruit of choice (apple/pear/pineapple). Heat sauce pan on high, when hot. swirl in 1 Tbsp cooking oil to cover the bottom or fully spray it. Add chopped onion, stir for 2-3 minutes until light brown and start giving off aroma then add crushed garlic. Add all remaining ingredients and puree fruit into sauce pan. Stir to mix then adjust heat to medium low. Simmering for 10-15 minutes to reduce the sauce and make it thick. Turn off heat and set aside to cool off. Re-blend/puree if desired. Use this sauce to marinade your ribs, dip or save inn fridge for later uses. Transfer cook ribs into oven by arranging them onto baking sheet. Brush extra BBQ sauce on them. Bake for 5-10 minutes, then turn, brush some more sauce and bake an additional 5 minutes or until all sauce caramelized. Remove from oven and serve while they're hot.